To really know someone, you need to peel back the many layers to get to the fruit, the stuff that makes up the core and is raw and fleshy and real. I believe however the layers are equally important if not more so than the core, because it is within those layers that lie the answers to who that someone really is. They aren't you in their entirety, but they make up who you are. The layers are made up of stories and experiences, some of which have at one time threatened the security of the core, at others has shielded it. In my opinion, the layers are the best bits, the most interesting bits, the true bits. I feel like I share a lot of myself on this blog. My fears, fails, triumphs and many idiosyncrasies. But there are many layers I have kept to myself. I often get asked about my legs and accident, my fight with depression and I am always happy to talk about it. It's just I have never really talked about it on a broad scale. If I am completely honest it is partially because of fear. 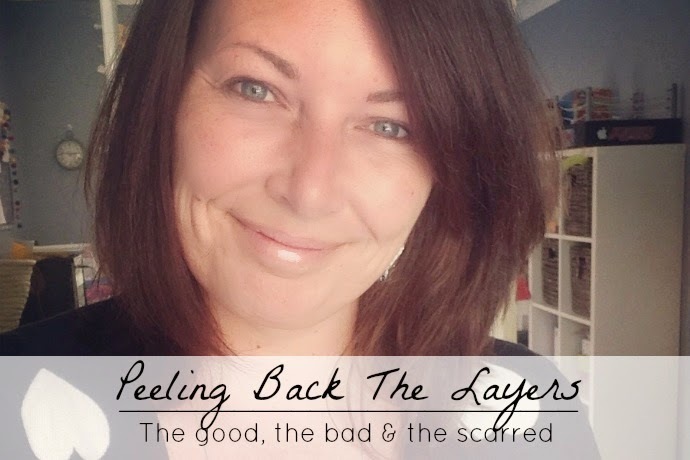 The fear of being judged or labelled and the fear of those layers being mistaken for my core rather than what they really are, just part of the overall story of who I am. A few weeks ago I attended a brunch for the Australian Bloggers Festival and I was joined by a bunch of my fellow bloggers. Some of whom I know well and adore and others were new friends I am only just getting to know. We all have different backgrounds and different stories to tell, but the one thing we all had in common was a willingness to expose some of the layers to each other and discuss the issue of mental health. My own emotional health (I prefer that term over mental health) has had a rocky road. I am what you would call a scarred civilian in so may ways. I have scars that are visible to the onlooker and I have scars within the layers that you can't physically see. But the one thing I do know about scars (both emotional and physical) is that the more you hide them, the more power they have over you. If you can be brave enough to bare them to others, that act will bring with it a sense of freedom and those scars will no longer bind you in pain or fear. Have you ever sat with a group of people who one by one show each other their physical scars? You know the first guy shows his scar on his arm from when he had an operation once, and then the next person rolls up their jeans to show a scar from a fin chop. Suddenly everyone is pulling up shirts and rolling up sleeves and proudly showing each other their damaged and marked bodies. It's liberating in a freakish way when you do this. I have only done it a few times with the scars on my legs, I have never been overly brave when it comes to my physical scars. And yet a few weeks ago I opened up to the room full of bloggers and I talked about my biggest scar of all - my emotional breakdown. I have very strong feelings when it comes to mental health awareness. Too may people hide their pain behind smiles and fragile facades. They hide it so no one else can see it, but by doing so, no one can help you either. I tend to see through those camouflages. Maybe because I know every trick in the book when it comes to putting on a front for others, maybe because I have worn those very same smiles and rickety facades or maybe because I know a fellow wounded soul when I see one. I hate that we hide our scars from each other. We help no one by doing so, including ourselves. And so I have decided to roll up my sleeves and share my scars with you and I hope by doing so I inspire you to do the same. Share with me with us, share with your partner or a friend, just promise me you will just share with someone. Not just to relieve yourself of the burden, but to encourage the dominoes to fall, the sharing to flow and the shaky facades to come tumbling down. Once a week over the next six weeks I will share my story. The operations as a kid, the accidents and my emotional breakdown and reconstruction. I don't want to talk about it every day on this blog as part of my healing comes from not living in the past and the thing I love about this blog of mine is the general positivity in which I write here (apart from the occasional ranty pants venting of course) I don't want that to change and it won't change. But I stand by the belief that the hiccups in life are just as important as the rest of the bits and so once a week on a Sunday I will break my story down into 6 bite size chunks. Just enough to peel back the layers so you get to know me, the real me the good bad and the scarred me - mental warts and all. It's time to show our scars people. Are you ready to get your brave on?